Pig cheeks are rarely seen these days - I suspect it's too much trouble for butchers to cut them out. But if you can find them, after a good long braise they are truly delicious. Heat some olive oil in a frying pan. Season the cheeks with salt and pepper both sides and then brown them in the oil. Finely chop the onions. Remove the cheeks from the pan, and cook the onions until soft and slightly browned - about 10 minutes. Add the stock and the cider, and return the cheeks to the pan. Peel, core, quarter and slice the apples and add them to the pan. Preheat the oven to 160℃ (320℉). Transfer the contents of the frying pan to an oven-proof dish or casserole, put a lid on it and place in the oven for 3 hours. When cooked, remove the cheeks and set aside. Strain the liquid back into the frying pan and reduce on high heat until it is about half the original volume. Taste the sauce and make any adjustments you feel are necessary - I added some soy sauce to mine at this point because I thought the apple flavour was too strong. Serve with mustard mash, asparagus or other vegetables. The video above is from the Keef Cooks YouTube channel. 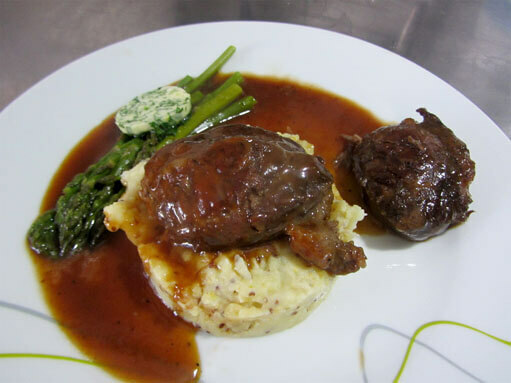 Click here to see the video recipe of Pig Cheeks on YouTube. Salt and ground black pepper to taste. Olive oil for sauteeing. Total time: 3 hours 30 minutes.